If the new Man of Steel by Brian Michael Bendis had been called "Superman: The Rise of Rogol Zaar," I might rank the book slightly higher. This is a good, respectful take on Superman -- I have no major qualms so far about Bendis' portrayal -- but despite the slice of life covers, what this is not is a story that warranted the same name as John Byrne's superlative 1986 Superman origin. There are no flashbacks to Smallville or Ma and Pa Kent here, no Superman originally joining the Justice League, no "Death of Superman," to re-establish the somewhat murky origins of Superman in the Rebirth era whatsoever. I give points to Bendis actually for not mucking with the past and really actually picking up directly from recent Super-title events -- that is, not wiping the slate clean, as it would be fair for him to do, but rather coming on as a good team player. But in a case of over-hyping, this is not a Man of Steel-esque story, and it's a disservice to the history of the character to have labeled it so. 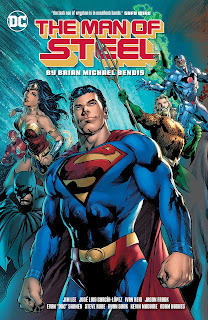 There is an extent to which Bendis' Man of Steel is a smaller story, perhaps surprisingly. There are grave consequences here for the bottle city of Kandor, to be sure, but in broad strokes the collateral damage is small -- a fight across Metropolis, and then a fight in space and in the Earth's core. I don't mind that, because as Bendis demonstrates in the final sequence et al, Superman's dilemma here is largely psychological, dealing with the sudden departure of his family just as Rogol Zaar arrives with secrets about Krypton's destruction. This is well and fine with me, a take on Superman concerned just as well with what he's feeling as who he can hit. Again, I think the final sequence is strong -- Superman going blow for blow with Zaar even as he remembers his recently-returned father Jor-El's suggestion that a greater destiny awaits Clark and his son Jon; in the face of Zaar's hate for Kryptonians, we see at once Superman's vacillation between belief in and mistrust of his father's claims, his uncertainty whether he's done right letting Lois and Jon go off with Jor-El. Though clearly Bendis builds drama well, I wonder about crafting the story to turn on Lois and Jon's whereabouts. For reasons I don't fully understand, concern for Bendis unraveling the Super-marriage began almost as soon as Bendis was announced for the character. Here, Bendis stokes these concerns, teasing at the beginning some sort of unseemly split between Clark and Lois, which is one of the reasons my support of the Super-marriage has waned -- creating drama often requires injecting a note of unseemliness into the Kent-Lane marriage, but which must then always necessarily turn out to be a feint. The end of Man of Steel comes suddenly, and ultimately the reader only has a little time to truly feel the loss of family that Clark's been feeling all along; while I liked the final sequence, in some respects I think Bendis' attempt to be coy took some drama out of the rest of the book as a whole. Of course I have nothing but praise for Bendis for anchoring Man of Steel in both Action Comics: The Oz Effect and Super Sons of Tomorrow. I've gone on at length about how Oz Effect itself failed to meet its own hype, and to an extent I intuit Oz Effect got short-changed by Bendis' sudden arrival, so it's a boon to the reader if nothing else that Bendis doesn't quickly sweep Jor-El's resurrection under the rug. Much the same too for Super Sons (we might say Bendis nods to both Dan Jurgens and Peter Tomasi's antecedent runs here); knowing now about Bendis' forthcoming Wonder Comics imprint, the fact that Super Sons of Tomorrow is on his mind seems key indeed. Bendis' reputation precedes him, complaints of choppy dialogue and decompression. We see a little bit of that in the story from Action Comics #1000, but by and large it didn't bother me. Bendis certainly demonstrates himself a craftsman better than some at DC with his ability to let a scene do two things at once, like the priceless scene where Clark faces off with Jor-El while Jon worries about contraband in his dresser in the background. (Bendis and artist Jason Fabok make excellent use of the tough conceit of repeated panels in these sequences.) Bendis' Superman is probably both a little meaner than some would like (when he jokes about Batman dropping criminals) and a little too reserved (when, a couple pages later, he chides a girl for foul language), but I have seen depictions of Superman that swing far farther from the center and, for Bendis' first Superman outing, this is darn good. Man of Steel is also a visual masterpiece, making again the inaccurate naming all the more unfortunate. I declared Fabok a star after his run on Geoff Johns' Justice League, and he succeeds here not with a sweeping cosmic scene but rather a difficult, tight, contained family drama; for me, Fabok's Superman Clark Kent is the definitive Superman/Clark of the book, akin to Gary Frank on Johns' Superman run. Ivan Reis seems quite at home here, having drawn Superman for a while; Steve Rude brings a touch of weirdness to an Ambush Bug cameo (and Perry White's angst). Ryan Sook's depictions are appropriately moody in a Batman appearance; Kevin Maguire and Adam Hughes both do fine work broadly against type with the book's two climactic fight scenes. For me, after reading Man of Steel by Brian Michael Bendis, any concerns I had are assuaged. This is a strong debut, stronger perhaps in my opinion than the Rebirth debuts of the last Superman co-teams. Even if we posit that Bendis is dispatching with those Super-elements he doesn't favor, this was a smooth way of doing it, and furthermore Bendis not only writes a capable, mature Supergirl, but I appreciate that Supergirl now gets a tertiary role in the proceedings. This is not Man of Steel, the original -- it is really, really not -- but it is a good Superman story, and I'm excited to see what Bendis does next. I was not impressed by Bendis's story in Action Comics #1,000 to say the least, but this mini was a pretty good start to this new era of the Superman books. That doesn't mean much, since his X-Men run started out great but ended terribly, but so far I have to say Bendis hasn't been this good in a long time, and his Jinxworld books are on fire as well. While I was rather disappointed that Pete Tomasi's Superman run was ended so Bendis could take over the book I read the mini hoping for the best. The 2018 Man of Steel was a huge letdown. It was primarily a big fight w/ not much in the way of story development & having Lois & Jon sent out to space was a poor excuse to shove them out of the books while Bendis changes the status quo. Also having a different big name artist in each issue doesn't make it look like an All-Star book, it actually gives a rather disjointed reading experience & there's additional art of a few pages by 1 more artist that was tacked on!